I'm actually about to head off to do a workshop for a lovely group of ladies this morning (what a nice way to start the week! ), so I'll have to make this quick. This month in Technique classes I taught the Chalkboard and Black Magic techniques...lots of fun! 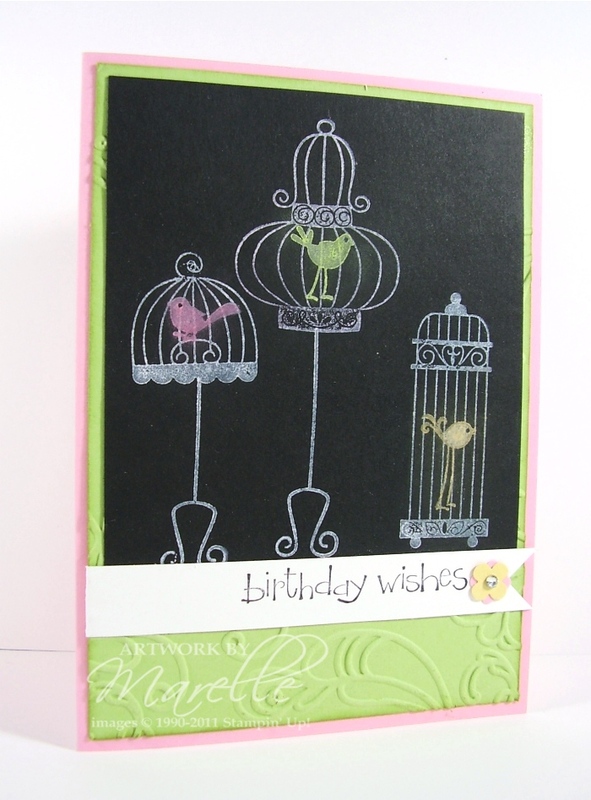 We made this card using the Aviary set for our chalkboard card. It's a very easy technique - just stamp in Craft White ink, and then dab Stampin' Pastels on top with a sponge dauber, while the ink is still wet. The chalk sticks to the ink, and the colours really pop on dark cardstock. ...I'll be back later to show you the Black magic card too. Such a great technique and a lovely result. I have never tried the chalkboard technique before!